That Includes Access To The Unit Recordings, Slides And Bonus Material Handouts. You can have the most fabulous event in the world, but if no one knows about it you will be out of luck when it comes to selling tickets and filling seats. 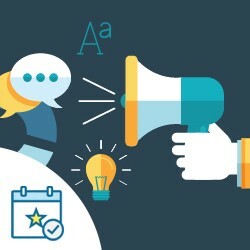 Every organization wants their events to get noticed, and this unit has strategies to make your event’s marketing material sizzle, tips on how to create media releases that get read, and discusses ways to engage social media influencers. If you you want to make sure you market and promote your nonprofit event right, this new CharityHowTo course is for you! attract social media attention, and sell event tickets. Your presenter, A.J. Steinberg, is on a mission to help nonprofits create amazing fundraising events with strategies and resources to build events that are more deeply engaging, far more profitable, and easier to produce than they ever thought possible. As a nonprofit event producer, A.J. understands the pain organizations go through when trying to create special events. After twenty years of producing successful fundraisers, she teaches simple systems that allow small-shop nonprofits to create professional-quality events that will shoot revenues sky-high and create meaningful guest experiences. A.J. Steinberg has been creating outstanding special events since 1999 with her Malibu, California-based event production company, Masquerade Events. In 2015 A.J. created Queen Bee Fundraising, which focuses on the art of nonprofit event management. Along with producing nonprofit events, A.J. teaches strategies for producing successful fundraising events and effective volunteer committee leadership. She also leads event planning workshops, and is a contributor with the Charity Channel Press. A.J. works with a broad spectrum of nonprofit clients, including The Jane Goodall Institute, Cystic Fibrosis, BreatheLA and Union Rescue Mission. She is a recognized leader in the field of committee-based fundraising.